2Young Research Society, Shahid Bahonar University of Kerman, Kerman, Iran. Nano Co3O4/ZnO has been successfully synthesized by a simple and green gel combustion method followed by calcination at 600 o C. Sugar was used as fuel for combustion in this work. The nano Co3O4–ZnO was characterized by X-ray diffraction (XRD), Energy Dispersive X-Ray analysis (EDAX) and Scanning electron microscopy (SEM). Co3O4–ZnO was applied as an adsorbent to remove lead from aqueous solution.EDAX strongly proved the adsorption of lead on the surface of Co3O4-ZnO adsorbent. By increasing the amount of ZnO on the structure of the Co3O4-ZnO samples, the adsorption of Pb2+ on the surface was increased too. The SEM images also help the confirmation of lead adsorption on the surface of as synthesized samples. The concentrations of remained Pb2+ ions were also measured by atomic absorption spectroscopy (AAS) and reported in terms of removal efficiency. By increasing heavy metals in the environment, heavy metals pollution has become a critical issue and attracted considerable attentions because of both acute and chronic toxicity . Heavy metals have released to the environment by industrial manufacture such as pesticides, fertilizers, dyes, drugs, battery, tannery, fossil fuel, ceramic and glass industries printing [2,3]. Lead (Pb2+), as a heavy metal, exist as pollutant in soil and water. Lead should be removed from water because of its high toxicity, non-biodegradable nature and bioaccumulation in the food chain [4,5]. Pb2+causes serious nervous system problems, gastrointestinal diseases, blood and brain disorders, and cancer [6,7]. To remove Pb2+ from wastewaters, several methods have been handled such as coagulation , floatation , precipitation , solvent extraction , adsorption  and ion exchange . Adsorption, among the mentioned method, because of simplicity, and low cost is the most promising one [14,15]. Many different adsorbent have been applied to remove lead from wastewaters including zeolites , activated carbons , fly ash , and metal oxides . Different synthetic method have been reported to produce nano Co3O4- ZnO such as electro-spinning process , homogeneous precipitation method , plasma enhanced–chemical vapor deposition , and photochemical coating method . Co3O4- ZnO were used as photocatalyst for degradation of rhodamine B dye , piezoelectric transducer , and gas sensor . Herein, we have synthesized nano Co3O4-ZnO by simple and green gel combustion method. The fuel was used for combustion in this work is Sugar. This method has never been reported for the synthesis of such material previously. 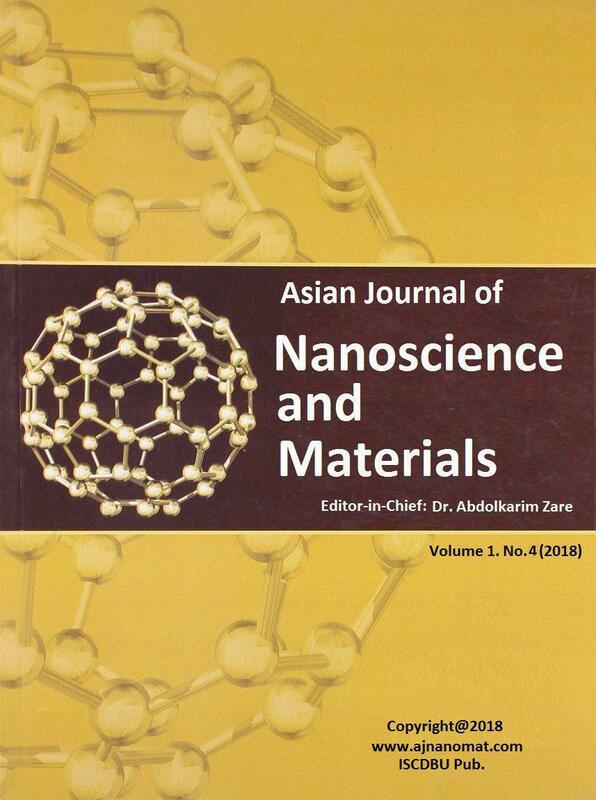 The nano Co3O4-ZnO were characterized and the adsorption of Pb2+ on its surface was investigated. To prove the adsorption of lead on the surface of as synthesized samples we used EDAX and SEM analysis. Moreover, the concentrations of remained Pb2+ ions were also measured by atomic absorption spectroscopy (AAS). Zinc nitrate hexahydrate, cobalt nitrate hexahydrate were used as precursors. Commercial sugar purchased from the local market was used as a fuel for combustion. lead nitrate solution was used for adsorption, which was prepared by dissolving lead nitrate (Merck; >99%, LR grade). Co3O4 was synthesized by the gel combustion method, which is used to synthesize ZnO nano structures, before . Cobalt nitrate hexahydrate was applied as the cobalt precursor. 0.01 mol (2.91 g) of cobalt nitrate hexahydrate and 5 g of sugar were dissolved in 30 mL distilled water. The reaction mixture was placed on a hot plate at 250 ̊C. During the heating process, water vapor and nitric gases were released and the gel is formed. The gel was then calcinated at 600°C for 2 hours and characterized for further use. Where C0 is the initial metal ions concentration (mg l−1) and Cf the final Pb2+ concentration (mg l−1). XRD of Co3O4 is represented in Figure 1a. The sample in Figure 1a having crystalline morphology with broad peaks match well with the Co3O4 JCPDS card 43-1003. The apparent peaks at 2θ values of 19.01, 31.22, 37.12, 38.95, 44.18, 55.87, 59.50, 65.48 and 77.23 correspond to the crystal planes of (111), (220), (311), (222), (400), (422), (511), (440) and (533) respectively, which confirms the formation of pure Co3O4 . The crystal size of the sample was calculated by Scherrer equation. The average particle size of the cobalt oxide was found to be 43.685 nm. XRD patterns of as synthesized Co3O4-ZnO nanoparticles are shown in figure 1b-e. It is observable that ZnO peaks is presented on the patterns. The average particle size of Co3O4-ZnO 9:1, 8:2, 7:3, and 5:5 are 35.023, 40.915, 46.600, and 52.950 respectively. Fig. 1. XRD patterns of a) pure Co3O4, b) Co3O4-ZnO 9:1, c) Co3O4-ZnO 8:2, d) Co3O4-ZnO 7:3, and e) Co3O4-ZnO 5:5. The EDX analyses results depict the presence of only cobalt and oxygen elements in the as-synthesized Co3O4 sample (Fig. 2(a)). 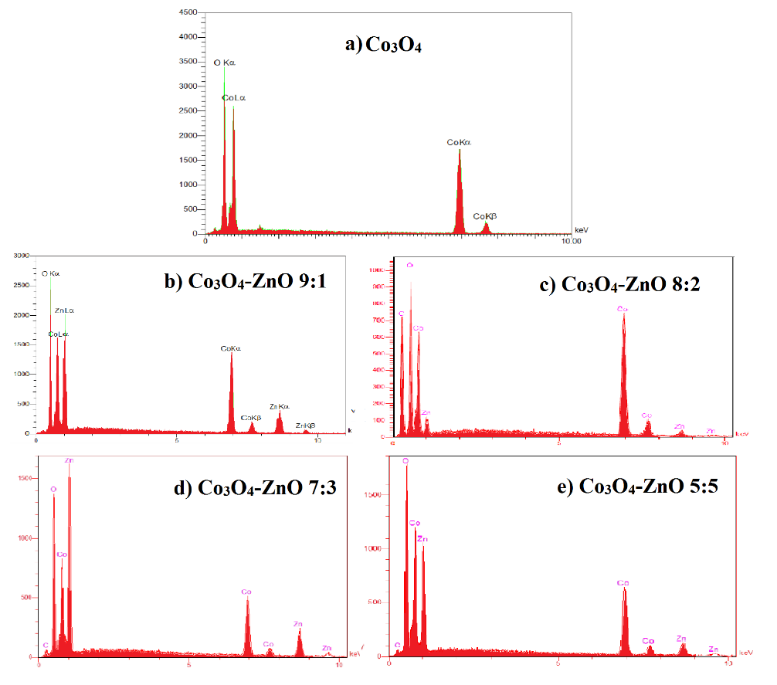 The EDAX analysis data of the Co3O4-ZnO indicate the presence of Zn atoms besides Co and O atoms, which prove the samples, are properly synthesized (Fig. 2(b-e)). Moreover, it is clear that no other peak related to any other impurity has been detected in the EDAX, which confirms the synthetic process was carried out appropriately. Mass and atomic percentages of different elements is presented in table 1 (the rest are impurities). The EDAX spectrum of the synthesized lead adsorbed samples were shown in Figure (3 (a-e)). EDAX spectrums show just the presence of cobalt, zinc, lead and oxygen elements indicating the purity of both the adsorbent and adsorbate. By comparing Figure 2 (a) and Figure 3 (a), it is observable that two spectrum are approximately the same, showing that Co3O4 sample did not adsorb any lead. This similarity are also observable in figure 2 (b) and 2(c), indicating the sample Co3O4-ZnO 9:1 did not adsorb lead on the surface. The peaks found in between 2.5 to 3 Kev in Figure 3 (c-e) indicate the presence of lead on the surface of Co3O4-ZnO 8:2, Co3O4-ZnO 7:3, and Co3O4-ZnO 5:5. EDAX strongly proved the adsorption of Pb on the surface of Co3O4-ZnO adsorbent. As can be seen in figure 3, by increasing the amount of ZnO on the structure of the samples, the adsorption of Pb on the surface increased too. Mass and atomic percentages of different elements is presented in table 2 (the rest are impurities). Fig. 3. 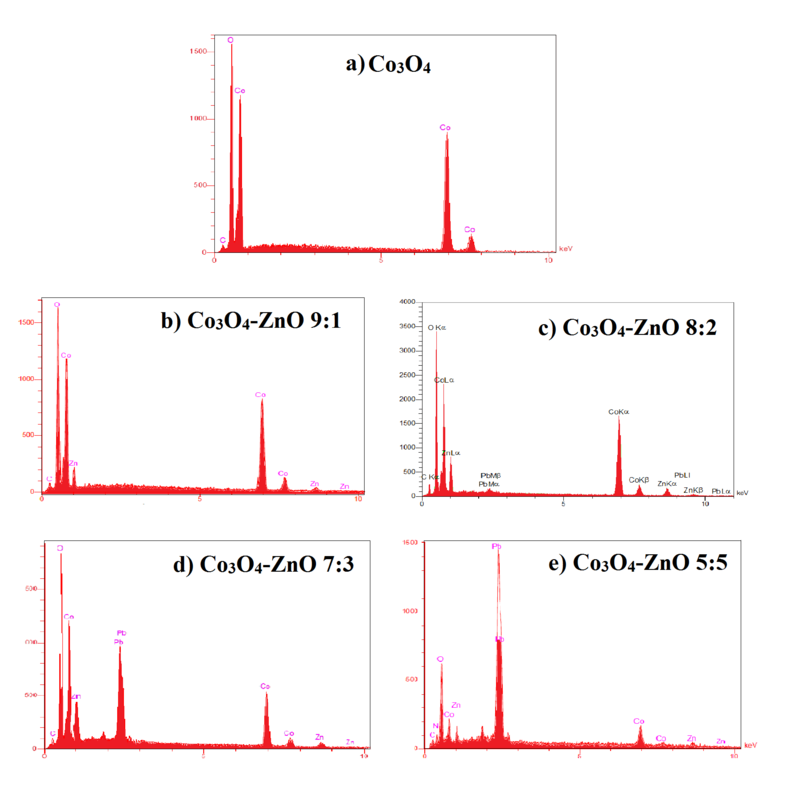 EDAX spectra of Pb2+ adsorbed a) pure Co3O4, b) Co3O4-ZnO 9:1, c) Co3O4-ZnO 8:2, d) Co3O4-ZnO 7:3, and e) Co3O4-ZnO 5:5.
relatively spherical. Besides, the synthesized nanoparticles are approximately homogeneous in nature. In the samples Co3O4 and Co3O4-ZnO 9:1 aggregation were occurred however, the other samples are distributed properly. Fig. 4. SEM images of a) pure Co3O4, b) Co3O4-ZnO 9:1, c) Co3O4-ZnO 8:2, d) Co3O4-ZnO 7:3, and e) Co3O4-ZnO 5:5. Figure 5 depicts the SEM image of lead adsorbed Co3O4 and Co3O4-ZnO nanoparticles. 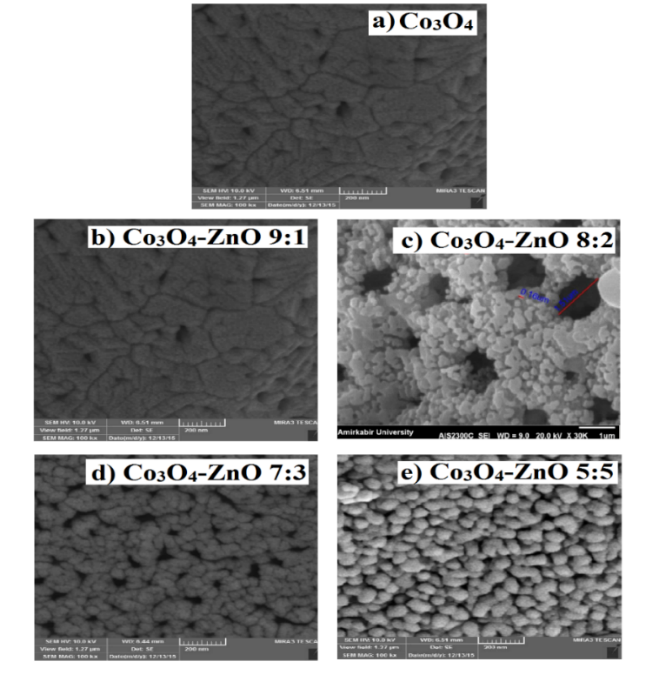 SEM images of Co3O4 and Co3O4-ZnO 9:1 before and after adsorption are not different because the pores between particles are not reachable by lead (comparing figure 4 and 5 (a and b). However, for the other Co3O4-ZnO samples, it is obvious that the distances between nanoparticles are covered after adsorption, which indicates the nucleating growth of lead on the surface of the adsorbent. These images help the confirmation of lead adsorption on the surface of as synthesized samples. Fig. 5. SEM images of a) pure Co3O4, b) Co3O4-ZnO 9:1, c) Co3O4-ZnO 8:2, d) Co3O4-ZnO 7:3, and e) Co3O4-ZnO 5:5 after Pb2+ adsorption. To study Pb2+ adsorption on the surface of Co3O4-ZnO samples, the concentrations of remained Pb2+ ions in supernatant were also measured by atomic absorption spectroscopy (AAS) and the sample absorbance was measured. The results of these experiments were shown in table 3. It seems that pure Co3O4 is not able to act as dependent to remove lead from solution. As can be seen, adsorption efficiency increase with increase in ZnO in the Co3O4-ZnO structures, for pure Co3O4 the adsorption efficiency was 0% and further increase in the ZnO the efficiency increase to 77.17% for Co3O4-ZnO 5:5. Consequently, Co3O4-ZnO 5:5 is the best adsorbent of Pb2+ compared to other adsorbents studied in this research. Table 4 compares the characteristic data of the current method with other methods for adsorption of Pb in different samples [2,32–34]. As can be seen, the result is better or in some cases comparable to the other adsorbents. It can be inferred from this comparison that Co3O4–ZnO have a high lead adsorption capacity. Table 4. Adsorption capacity of Co3O4–ZnO and other recently reported adsorbents. In this research, nano Co3O4–ZnO have been successfully synthesized by a simple and green gel combustion method followed by calcination at 600 o C. Sugar was used as fuel for combustion in this work. This study clearly establishes that Co3O4-ZnOis an efficient adsorbent for Pb (II) removal from aqueous solution. 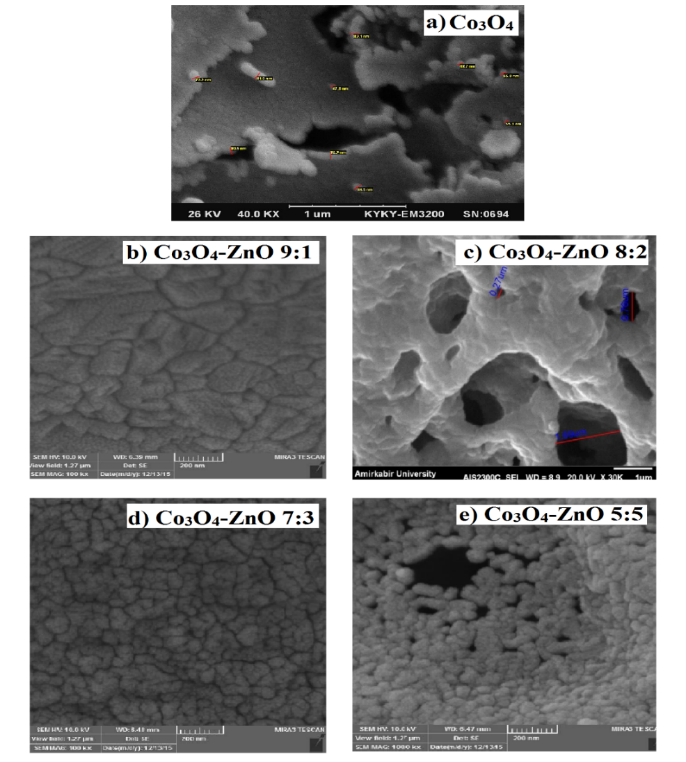 EDAX strongly proved the adsorption of lead on the surface of Co3O4-ZnO adsorbent. 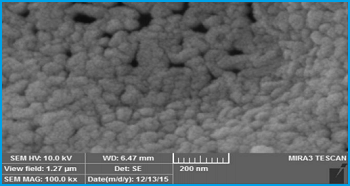 The SEM images also help the confirmation of lead adsorption on the surface of as synthesized samples. The obtained results of AAS show the adsorption efficiency increase with incensement of ZnO in the Co3O4-ZnO structures. Co3O4-ZnO 5:5 is the best adsorbent of Pb2+ compared to the other adsorbents studied in this research. In comparison with recent studies, in this work the adsorbent was synthesized by method that is more convenient with better or in some cases comparable results for lead removal. The authors are grateful to Research affairs of Shahid Bahonar University of Kerman for the financial support.